Serious Inquiry: Am I "Skate" Enough to Wear Checkered Vans? I can't stop thinking about skate style. It first started when I noticed that celebs like Sofia Richie were fans of skate sneakers. Once 2018 was established as the year of streetwear, I started noticing streetwear outfits everywhere (as I'm sure you have too). Soon enough, my fascination with the style narrowed in on the streetwear-adjacent skate style. You know the outfits I'm referencing—they revolve around grungy elements like chain belts, graphic T-shirts, and Dickies-style workwear pants. I wanted to know: Does testing out skater style make me a poser? I'm envious of how skate kids pull off a nonchalant air of "cool," so I'll admit it: I even went so far as to Google "how hard is it to learn to skateboard?" As it turns out, it's pretty hard. I figured I'd stick with replicating the style via my wardrobe (mostly to avoid any unnecessary broken bones). I started with the one piece that's arguably the most "skate": checkered Vans. The black-and-white checkerboard graphics are unmistakable and, in my opinion, are what make them the most iconic. The Classic Slip-On sneakers were invented in 1977 in Southern California, and they became the go-to shoes for the Venice Beach skate scene from there. Decide for yourself: Am I "skate" enough to wear the Vans? Naturally, I wanted to test-drive the sneakers for myself. I love good sneakers as much as the next person, but I'm nowhere close to being a "skater girl", no matter how much I listened to Avril Lavigne on repeat growing up (ask anyone in my family—2002's "Sk8er Boi" was on repeat for a month straight). Though as much as a chain belt always earns a double tap from me, jeans with XL cuffs and a seatbelt-style belt are the pieces I chose to play up the sneaker's grunge vibes. Below I'm sharing some of my outfits with checkered Vans that bridged skater style with my own style and the essential pieces to shop to get the look for yourself. 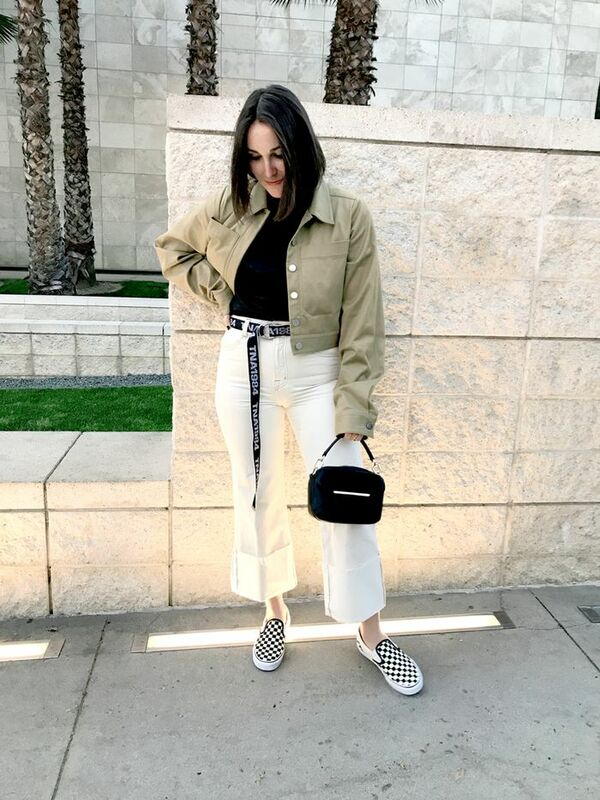 @annaflorencelaplaca; PICTURED: Jacket; Tna Leslie Web Belt ($30); J Brand Joan High Rise Crop Jeans ($248); Henri Bendel bag; Vans Checkered Slip-On Sneakers ($50). I wanted this outfit to be "extra" in the best way possible. I paired the extra-long canvas belt with a pair of jeans that have an exaggerated cuff to create a streetwear appeal. @annaflorencelaplaca; PICTURED: Handmade top; Tna Skater Pant ($78) and Leslie Web Belt ($30); Vans Checkered Slip-On Sneakers ($50). I liked how these workwear pants had a very Dickies-inspired appeal but were honestly just pretty in this light shade of pink. Plus, there was something unexpected about the combination of blush and black. @annaflorencelaplaca; PICTURED: Jacket; Reformation dress; Vans Checkered Slip-On Sneakers ($50). Lastly, I had to concede to something less traditionally "skate". There's something satisfying about the balance between the Vans and a springy floral dress. Available in sizes XXS to S.
Speaking of Vans, see the five most iconic Vans sneakers of all time.